It’s not uncommon for humans to bond with animals. You probably have a cat or dog that you love like a member of your family. You probably talk to it and treat it like a human child. Humans and animals have always had something special. While most people tend to bond with cats and dogs, one man recently formed a bond with some baby ducks. 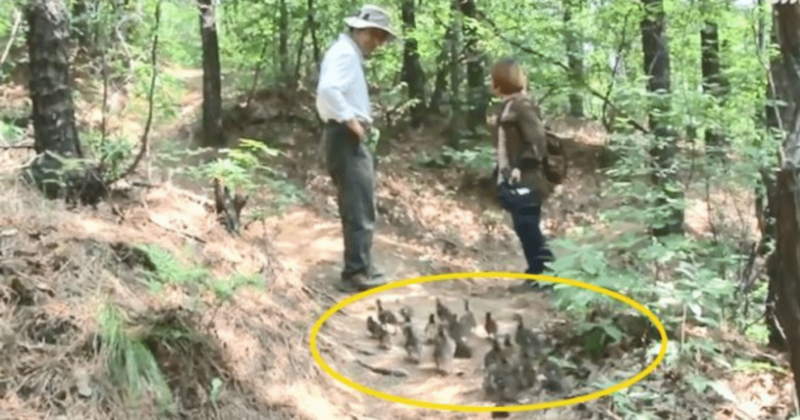 He has raised the baby ducklings from eggs, and he recently started taking them for hikes. Ducklings follow their parents, and since he acts as their father, they follow him wherever he goes. He hikes with the ducklings pretty regularly and through some rather rough terrain. Still, the baby ducks follow closely behind him. He started walking the ducklings as a way to get them outside to see if they could survive the wild on their own. Although he would love to keep the ducklings in his home as they grow, it’s impossible. He is currently caring for 20 of them, and he plans to let them live in the wild and his home. The man cared for the eggs before they hatched by keeping them warm in his home. He started caring for the ducklings as soon as they popped out of the eggs. They know he is their caregiver, and they follow him anywhere he goes. They tend to ignore others, including his wife. While these ducklings are getting attention for following their human father, another group of ducklings gets attention every year for following their mother through a school. Every year, a mother duck leads her babies from their home to a pond near the school. She walks them right through the hallways, and all of the children and staff come out to watch. Despite the crowd, the ducks stay straight on their path to the water. The babies aren’t a bit distracted and simply follow their mother, who has been leading the way for years. In fact, the ducks have been walking through the halls for 13 years. It’s something everyone looks forward to watching. The school keeps the ducks safe, too. There are some lucky ducks. They all have people who care about them and will go out of their way to keep them safe. They have all grown up with humans interacting with them on a regular basis, and they are doing all right. It’s not often that things like this happen, and most wild animals choose to keep their distance from humans. This proves that animals and humans can live in harmony and actually learn from each other. Hopefully, all of these little ducklings grow up to live long lives and teach their young to trust humans, as well. Stories like this remind us why we love animals. Watch their sweet interaction below.